This small children’s book by my favorite adult and children’s author is almost like a non-fiction children’s book. 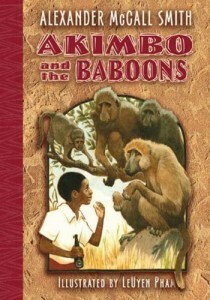 It is set in the bush in Africa, (where the author grew up), and gives wonderful images of the way wildlife lives there, as well as insights into baboon behavior. There are many children who show an interest in animals at a young age, and a book like this is a wonderful offering. It is both honest and interesting. It also portrays how children in other countries have experiences that we may not have in our own country. This children’s book could easily be a read-aloud in a second grade classroom, holding the interest of everyone because of the small amount of drama. I’d love to see it used in classrooms to expand our student’s awareness of both other cultures as well as the animal kingdom. It’s also a first chapter book for stronger readers. This book appears to be part of a collection of five children’s books about Akimbo. My guess is that they are all great. Check them out for your young scientists.